One package in one of my UFO bins was some blue gradient fabric and some gold gradient fabric, accompanied by "Ten-Minute Tile" quilt by H.D. Designs. I had made this quilt previously in September 2014 and liked it so much, I bought other gradient fabric to make another for me. While I bought the pattern from the designer, at a quilt show, a number of retail places offer it. 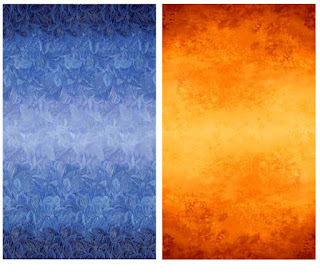 Just do a Google search for "Ten-Minute Tile pattern" and you'll come up with a number of hits to choose from. For the gradient fabric of this version, I used Timeless Treasures' Blue Bird Metallic Ombre and Northcott's Artisan Spirits Falling Leaves. They both start as dark at the selvages and blend to light in the center. This kind of gradient is required for this specific arrangement. If you use other gradient/ombre fabrics, you'll get a slightly different look. This top is approximately queen-sized and that's the reason why the picture isn't too terrific. 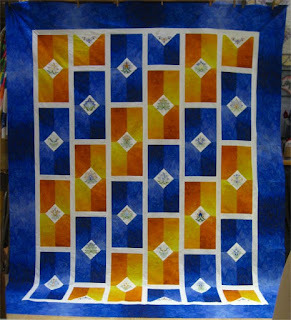 I don't have the proper space or room in the house to adequately photograph a quilt larger than a twin size ... I can't back far enough away to get the whole quilt in nor can I hang the top up far enough to prevent it from pooling on the floor! I'm sure you'll get the general idea anyway. For this version, I decided to machine embroider some designs on the center and half diamonds, just for variety. I used BFC-Creations' "11th Anniversary Set" for the center diamonds and a design from SewForum (no longer available) for the half-diamonds. All the embroideries stitched out just beautifully and I'm very pleased with them. Here are 4 of the 11 different designs I used. 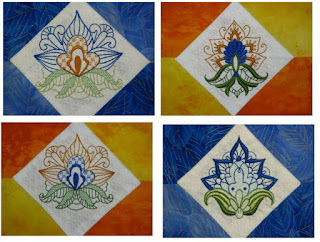 For these embroideries, I used Glide thread (the same that I use for longarm quilting) and the stitch-outs were beautiful. I'm very pleased with them. This finished top goes onto pile of Tops to be Quilted, which is an entirely different project. :-) For now, I'm very, very happy to have completed a UFO crossed off my list and made room in that UFO bin. * Friendship Braid, using half-hexies. 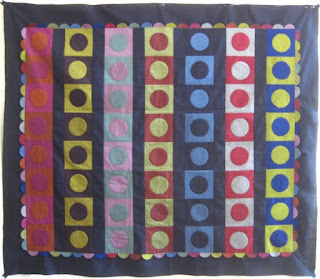 This scrappy quilt was given to a local child care organization that I like to support, the Bay Area Crisis Nursery. This is a standard "friendship braid" but uses half-hexies instead of noodles. The result, although very similar to the noodle-based braid, is subtly different. By using half-hexies, you get a slanted angle where the segments meet (and during construction, there is less waste when you trim the outer edges). I was very pleased to be able to make this quilt using scraps on hand. I used the pantograph, "Chantilly Lace" to quilt it. *Two fund raiser quilts. Both quilts are about 44"x 60" and I was very pleased to be able to make both of these quilts using scraps on hand. These quilts will be used for the annual fundraiser for the Santa Cruz Toddler Care Center. 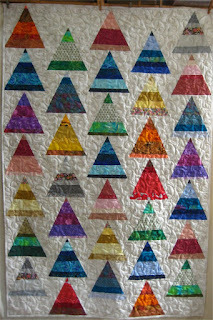 I blogged about one of them (the pyramids) previously but now, it has been quilted and bound. 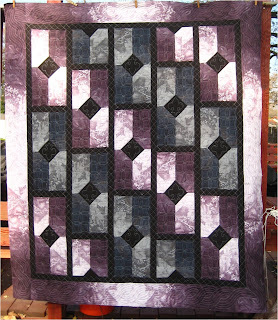 This has been quilted using the "Flirtacious" pantograph. 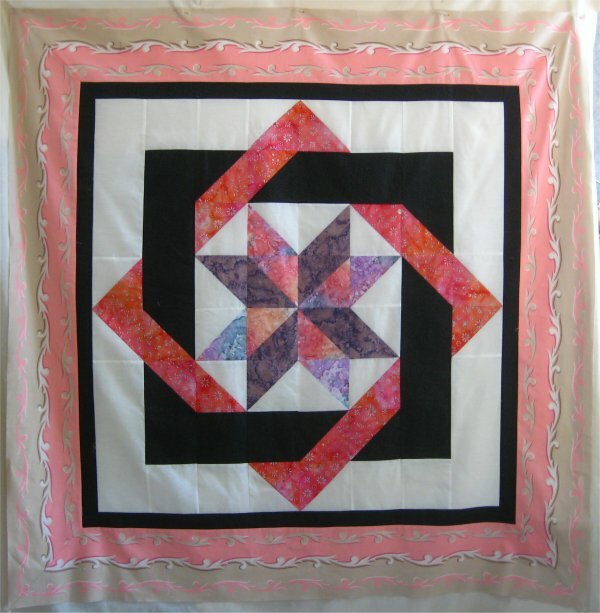 The other quilt is also constructed using half-hexies but in a completely different arrangement. This was quilted using the pantograph, "Chantilly Lace". * Labyrinth. This was a workshop given by the guild I was a member of in 2013. 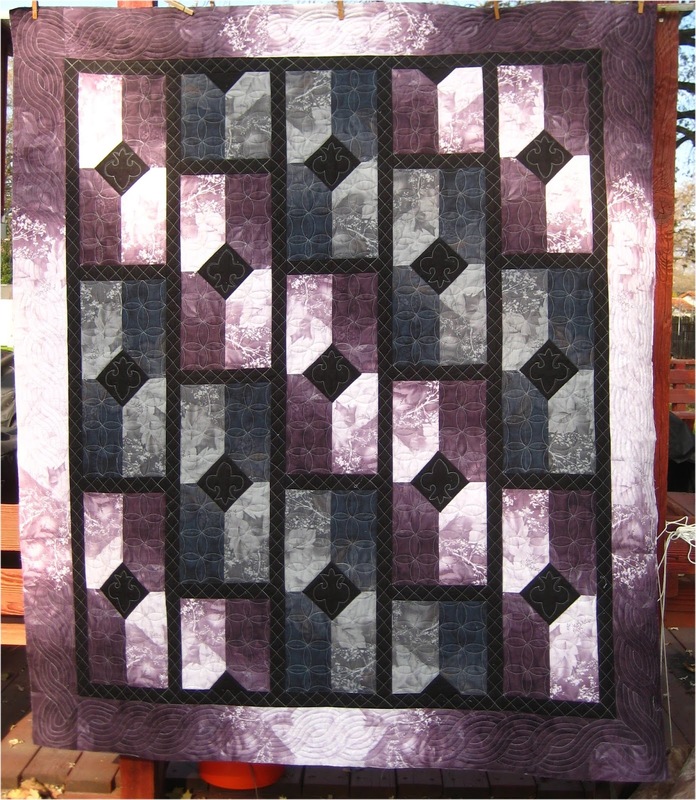 The pattern is "Labyrinth" by Calico Carriage Quilt Designs. I only partially finished the top during the workshop. Back home, I was probably working on some other project, so I tucked Labyrinth away for a later time. Well ... 3 years later, it's time to get it finished! * Lipari. Lipari is the name of the Oakshott fabric collection I used to make this crib-sized quilt, although it's never going to grace any crib, if I have any say about it! I saw the quilt at a vendor at the 2012 PIQF (Pacific International Quilt Festival), here on the West Coast. 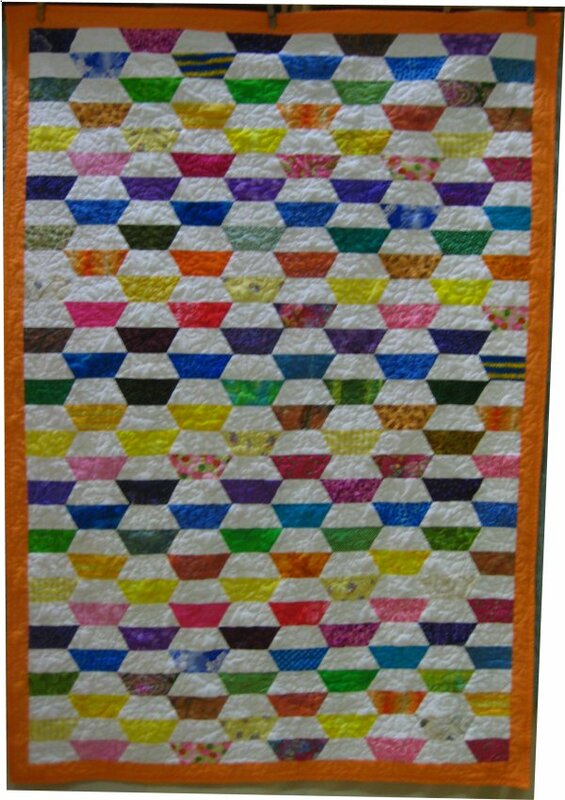 It was made from a pattern in the Spring/Summer 2012 issue of "Quiltmania", a European quilt magazine. I bought a packet of fat eighths, a background fabric, an extra fat eighth of a royal blue and the magazine to make the quilt. The vendor didn't have the magazine on hand but mailed it to me. When all the supplies arrived, I bundled them up and put them away, since I was probably working on another project at the time. Finally, in 2016, I hauled it out because I knew it wouldn't take very long to complete. 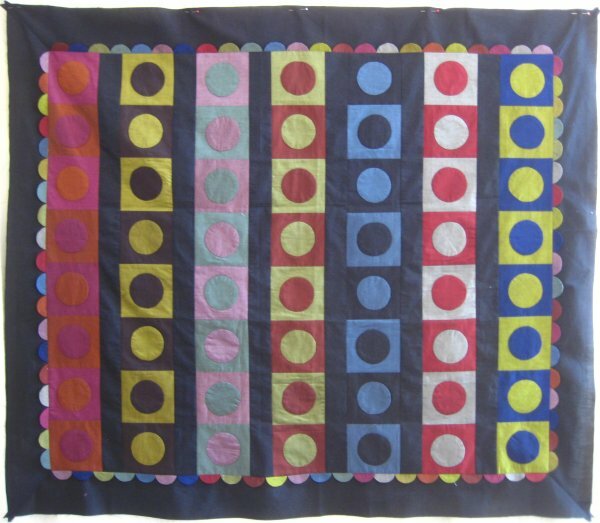 Essentially, it is squares with circles appliqued on them, the squares are then sewn into columns and then surrounded by a border. However, the fabric that I bought was NOT what the pattern called for. By reading .. and re-reading VERY CAREFULLY .. I was able to PRECISELY cut out what was needed .. except for the little circles around the border. The fat eighths simply would not allow for cutting the circles of the size called for; I had to make my circles just a bit smaller. Furthermore, the vendor sold me EXACTLY the amount of black fabric for the sashing and borders. I mean EXACTLY. I had *threads* left over when all had been cut. Which means I have NO black Oakshott fabric for the binding. I tell you, I was pretty irked. I'm going to need to buy more and it's not going to be the same dye lot, obviously. I can only hope that it's not horridly mis-matched. Furthermore, I was not particularly happy about the way the pattern was written. It very well could be that I am simply used to the way American patterns are written, but this one was just off-center somehow. The most glaring item was how the borders were constructed. First, the pattern calls for mitered borders. Honestly, since the borders are plain fabric, there's no NEED for mitered borders; butted borders would have sufficed. However, I wasn't thinking very clearly and proceeded to do the mitered corners. For me, it's no big deal; I enjoy mitered corners in borders. BUT ..... *these* instructions have you CUT THE MITER on all four border pieces before sewing them together. OH MY GOODNESS .. if that isn't a recipe for disaster, I don't know what is. One SLIGHT mis-cut or mis-measurement and you can kiss those mitered borders goodbye. I did NOT construct the mitered borders that way; I used the technique that I thought was in standard useage. Although I didn't use this particular tutorial, it *is* representative of how I normally sew a mitered border. And in my humble opinion, a much better technique than the one presented by the pattern. 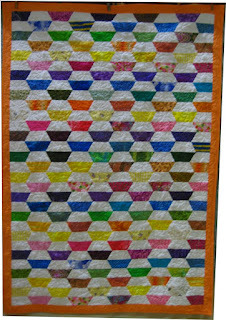 It's not quilted in this picture but I plan to load it onto my Tin Lizzie as the next quilting project to be worked on. The following projects didn't come from the UFO bin but are new projects that managed to completely distract me. What I did find at a local quilt show was a 4 panel strip, printed pictures of vintage trailers! Perfect! I cut the panels apart and re-connected them with English paper pieced hexagons and teeny-tiny triangles. Coordinating strips finished the sides. I did minimal quilting: a lot of free motion outlining, SITD and spirals in the hexies. It now hangs on the bathroom door .. the only long vertical spot in the entire trailer. 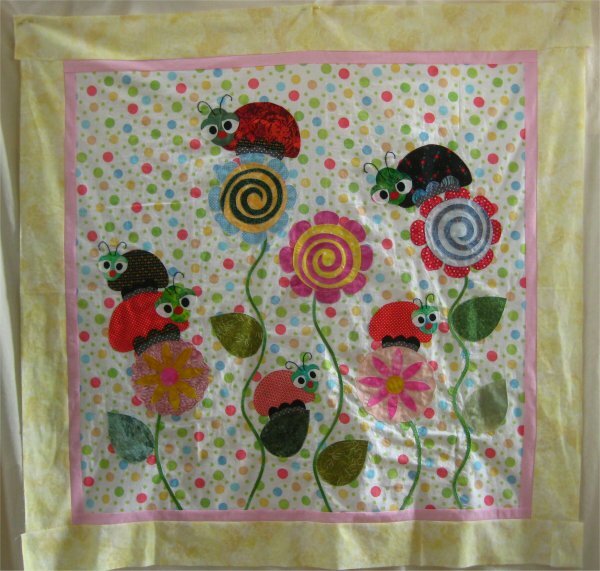 * Ladybugs and Kisses quilt. 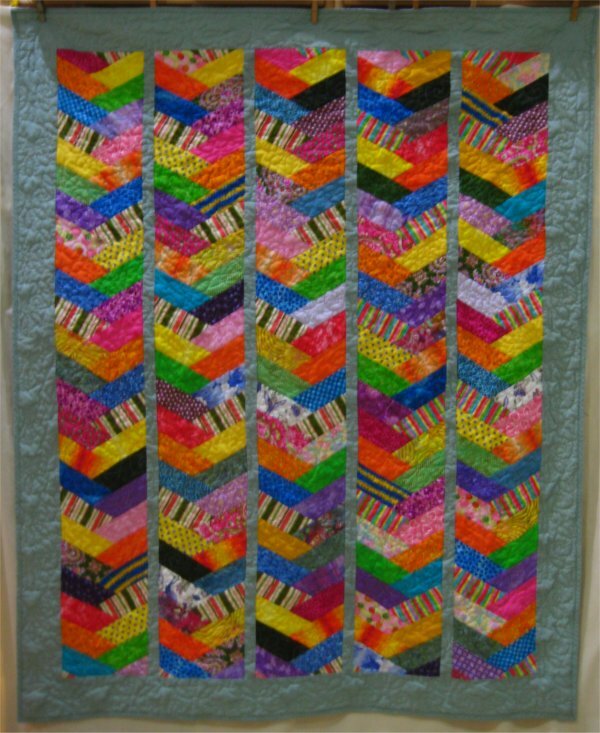 This is a quilt for a neighbor's 18 month little girl. It's a commercial pattern, "Ladybug and Kisses". 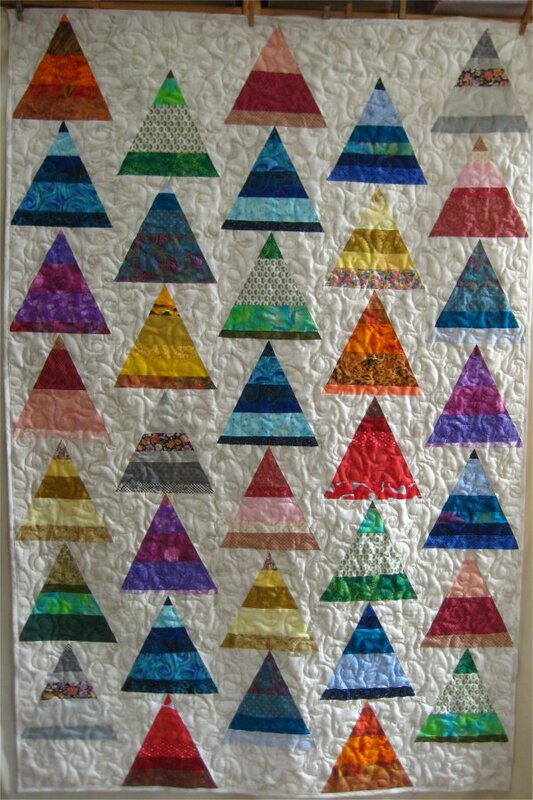 It is an absolutely, terminally adorable applique quilt. 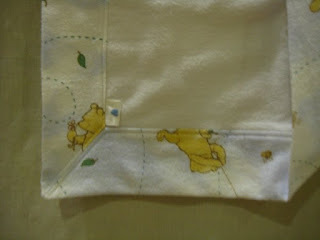 In looking at my notes and pictures, I can't BELIEVE that I didn't take a picture of the quilted, finished item! Truly .. I'm astonished. All that I have is a picture of the unquilted top. Wow .. what an oversight.